A Facebook video from Colorado’s Tejae Floyde shows you more of her Encased Hearts. Tejae loves pocket art – tokens and secrets and hidden wishes. The smaller heart fits perfectly inside the larger one and they are covered with wise words, rich textures and glints of metals. 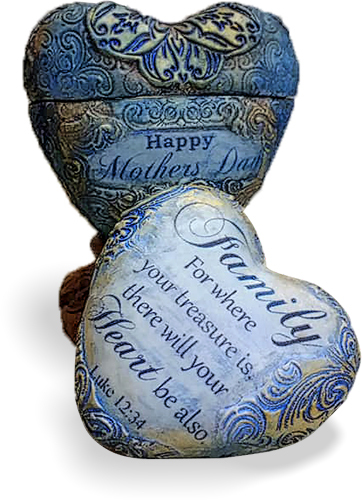 She’s been busy creating this stamped and painted Mother’s Day version, sometimes adding childrens names on the back. Read more about Tejae on her site, Facebook and Etsy. You’ll find Tejae’s step-by-step instructions for a basic encased heart in my book. Hi Cynthia! Thank you for the sweet feature. In case others were interested, the size of my encased hearts are a little over 2 1/2″ tall and 2 1/2″ wide. Fits in the palm of your hand. I’m in the process of creating decorative stands for them to sit on. That’s been fun. I hope all is well with you and your family. ? Yay Tejae! I love your sweet sentiments hearts!